She is the QUEEN of clap backs! Kris Aquino is one of the most controversial female personalities in the country. And with years being under public scrutiny, handling hate messages—especially on social media—is no biggie for her. 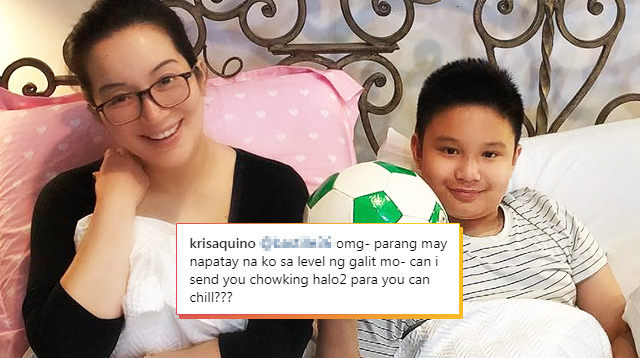 In Kris' recent Instagram post, she and her son Bimby are seen enjoying some down time while munching on snacks in bed. Writing on the caption, she said: "They schedule my work to make sure that after a TVC shoot, I get a full day to just relax, read, watch TV, and just have a ME day. Bimb is done with school, [and] swimming with coach JR is [for] later." In the comments section, though, one netizen quickly threw shade on the 46-year-old actress calling the act of eating on their bed "not setting a good example." User @bastille36 wrote, '"Yan ba ang example mo ang kumain sa bed? May sakit ba kayo para dyan kumain. Bakit hindi kayo sa kusina kumain. Be a good example!" And in true Kris Aquino fashion, she replied with a solid punch of wit and product placement: "OMG parang may napatay na ko sa level ng galit mo. Can I send you Chowking halo-halo para you can chill???"